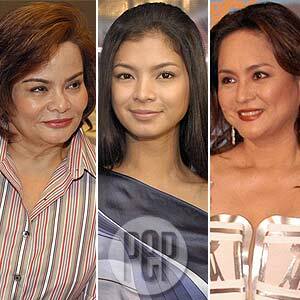 [L-R] Becky Aguila, Angel Locsin, and ABS-CBN executive Charo Santos. Becky Aguila says that no concrete plans have yet been discussed with ABS-CBN on Angel's projects. But she has given verbal assurance that they will sign the contract "as soon as Angel gets back." "Ate Jopay, saan pupunta itong interview natin? Ano ba ‘to? Ayokong mag-comment tungkol diyan, Ate Jopay, kasi gusto ko lang talaga magbakasyon," answered an "irritated" Angel Locsin when asked by Startalk reporter Jopay Mañago about rumors that she was about to transfer to ABS-CBN. The footage was taken at the airport, before Angel's departure for the United States, on July 5. STARTALK. Becky Aguila was with Angel during that ambush interview at the airport. The manager gives her side of the story. "In fact there was one text that I got from Dinno [Erece, PEP contributor] again [about the rumored transfer], and I texted back. ‘Masyado niyo akong pine-pressure parang binibigyan ninyo ako ng idea. Sige nga gawin ko nga iyan.' I texted something like that. "Kasi naiirita na ako kasi wala naman and yet ginagatong nang ginagatong sa isip ko. All we wanted to do was take a break, give our Angel a break. Let her enjoy the trip in the States and at the same time, get educated dahil sa sportswear line na bubuksan niya." LOYALTY. There have been reports saying that Angel told network executive Wilma Galvante that her loyalty was with GMA-7 and that she is not transferring. "Angel didn't say anything like that. But as a manager, I said, ‘When we come back, you'll be the first one to know.' Iyon lang ang parati kong binibitawang salita sa kanya, e," clarified Becky. She commented, "Ito iyong misconception na trinaydor namin sila, which is really crucial for us dahil sa credibility ko as a manager and it will go down in history, in showbiz, na winalang hiya namin ang GMA, which is not really true... Nasaktan na namin sila kaya nga ayaw namin ikuwento sa inyo kung ano pa ang mga detalye noon kasi parang double-kill na iyon, e.
"As a talent manager, kung hindi lang naman din sa amin, wala rin naman silang Angel Locsin or kung sino pa mang artista na sumikat diyan. Sana bigyan lang kami ng [courtesy] at respeto kasi iyon lang naman talaga ang nangyari, e. ‘Wag mo naman didirektahin ang talent. ‘Wag mo naman ini-influence din kasi doon kami nagkaka-gulo-gulo. So napaka-difficult noon, nung situation namin." KAPUSO. Becky admitted that she sent a "filler" to ABS-CBN while she was still in the United States. "Nagparamdam ako kasi manager naman ako. Option namin iyon as a freelancer," she said. Meanwhile, Wilma sent a network contract for Angel through Angel's lawyer, Joji Antonio, which was then handed to Becky. A network contract is an agreement between the talent and the station about the projects that the talent will star in. Becky arrived from the States on Tuesday, July 17. Her immediate agenda was to discuss the network contract with Angel's father, Angel Colmenares. She met up with Mr. Colmenares on July 18, Wednesday. "Pinag-usapan naming maigi and then tinawagan din namin si Angel... We were expecting another contract. I don't wanna expound on that anymore. We were expecting a better contract," she revealed. "Come Thursday [July 19], nag-usap na naman kami ni Daddy. The decision that came up is hindi na nga kami pipirma sa contract na in-offer sa amin ng GMA. "So we made a letter addressed to Ma'am Wilma, Annette Gozon, and of course, copy furnished si Atty. Felipe Gozon. Iniwan ko iyon sa aking P.A. [personal assistant]. Medyo late na kasi iyon, so sabi ko the next day [Friday, July 20] na lang i-deliver." She stressed, "They were the first ones to know." INGRATA? The day GMA-7 got the letter was also the day Becky started talking to ABS-CBN executive Charo Santos about a possibility of a career for Angel in the Kapamilya network. That same day also, ABS-CBN gave an offer. "Apparently that letter reached their office at around 2 o'clock in the afternoon. That was the time na I was negotiating already with ABS-CBN. That was a decision that we have already made. We don't want this naman na parang a bidding war for both networks. We don't want them to be fighting for Angel. Decided na kami talaga when we sent that letter. There was no turning back. It was a decision that we already made and we're moving forward," asserted Becky. She added, "Why not a personal meeting with her [Wilma]? Why a letter? We didn't want to add more anxiety to the situation. It wouldn't be favoring us or her. Siyempre she will be hurt. We didn't want to feel the hurt feeling anymore, so we decided na magsulat na nga lang nga ng letter ni Daddy." On July 22, Sunday, ABS-CBN's entertainment talk show The Buzz aired an interview with Becky Aguila and Angel Colmenares, saying that Angel's move to the network is "80 percent sure." KAPAMILYA. Becky believed that Angel will have a "more relaxed schedule" in ABS-CBN. A few press members pointed out that in most soap productions, schedule is not strictly followed. "Not all the time," Becky replied. "If you have a soap, that is presented to you in advance and then taped and then that particular [show] will be presented in one or two months, like what ABS-CBN is doing, then the possibility of a relaxed working habit for Angel will be more feasible." As of press time, Becky still has no idea what ABS-CBN is planning for Angel. "Wala pa kaming concrete. Basta andoon na iyong assurance namin sa kanila, verbally, na we're going to sign. So as soon as Angel gets back, pipirma na kami," she said.